Arch Facial Plast Surg. 2004;6:244-252. Kyle S. Choe et al. 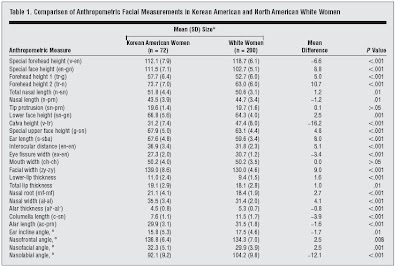 Objectives To assess the differences in facial proportions between Korean American (KA) women and North American white (NAW) women and to quantitatively describe aesthetic facial features in the KA women. Design Anthropometric survey and facial aesthetic evaluation. Participants Volunteer sample of KA women (n = 72) who served as models for part 1 of the study and a different sample of KA women (n = 5) and men (n = 5) who served as judges for part 2 of the study. All subjects were between ages 18 and 35 years and had Korean parents and no previous facial surgery or trauma. Intervention For part 1 of the study, standardized and referenced frontal and lateral photographs were taken of the models, and 26 standard anthropometric measurements were determined. Results were compared with published NAW standards. For part 2 of the study, 10 judges evaluated frontal views of the models for facial aesthetics using a visual analog scale. Quantitative analysis was done of the faces of attractive KA women (>90th percentile in aesthetic scores) and comparisons were made with the faces of NAW women and average KA women. Results The KA woman's face did not fit the neoclassical facial canons. Compared with NAW women, 24 of the 26 facial measurements in KA women were significantly different. Only 9 of the 26 facial measurements were significantly different when the attractive KA women were compared with the NAW women. Nine of the 17 nonsignificant facial measurements were very similar to those of the NAW women; many of these facial features centered around the midface. Figure 1. Frontal (A), lateral (B), and basal (C) views of the average Korean American woman's face. ac indicates alar curvature point; al, alare; al', alar rim; c, highest point of the columella; ch, cheillion; en, endocanthion; ex, exocanthion; g, glabella; gn, gnathion; mf, maxillofrontale; n, nasion; prn, pronasale; sa, superaurale; sba, subaurale; sn, subnasale; tr, trichion; and zy, zygion.